Model boat building is fun and very instructive if you intend building a full size craft. The RC MODEL X-1 uses the same principals of FAST-G (Fold And Stitch Then Glue) stitch and glue building method, only on a smaller scale. 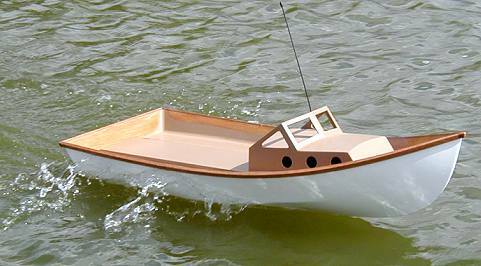 Not only will you learn but enjoy the building of a usable model boat. A full size pattern is given for virtually every part in the boat. And, inexpensive door skin (1/8" thick) is used for most parts. Just duplicate the patterns to the plywood, saw them out with a jig, saber, or band saw, drill for the stitch holes, and the boat is ready to assemble, fast and simple. The drawing and instructions are abetted with a series of captioned photos taken during the prototype building. You can almost build the boat by looking at the photos. The boat is intended for an electric, in line, inboard motor with speed and forward neutral and reverse, radio controlled. The rudder is also remote controlled to enable right or left turns to be made. Complete control of the boat is allowed, just like a full size one. The entire system is explained and detailed. Plus we call out the parts used on the prototype and where they can be obtained for those new to the world of radio controlled boat models. This is an excellent project for kids. Maybe with help from, mom, dad, or gramps. But of course kids come in all ages from toddlers to senior citizens. This is a project with universal appeal. Start building now. Fun is waiting, don't let it slide by.